My first experiment: will seeds that my husband bought me as a house-warming present when we moved to North Carolina nearly two years ago (that have been sitting on a shelf in the garage since) be any more successful than the much more expensive seeds I ordered from a reputable seed company? Only time will tell. 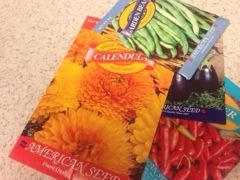 We got started with the $1 seed packets while waiting for the others to arrive in the mail. 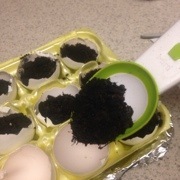 I rinsed eggshells and pierced a hole in the bottom of each shell and in the bottom of each section of the egg carton for drainage. 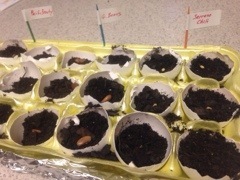 I cut off of the top of the carton and covered with foil as the base for the carton and filled each eggshell with soil. I found the smallest of my set of cupcake batter scoops worked perfectly for filling the shells. 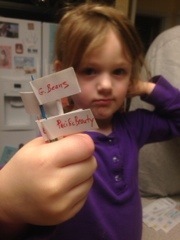 My trusty sidekick then helped me put labels on toothpicks to identify our Pacific Beauty, Eggplant, Green Bean and Serrano Chile Pepper seeds (I promise she was more enthused than she looks). The seeds are now sunning themselves in our guest room (apologies in advance to our guests) where they will receive plenty of sunlight. I am concerned because that room tends to be the coolest in the house which could hinder growth. If nothing happens soon, I may need to find a new location. I did discover in the process that a toothpick size hole in the bottom of the egg carton is not large enough to adequately drain. I had to go back and make larger slits to release excess water.